Complaints of the era included resentment of royal autocratic absolutism; resentment by peasants, laborers and the bourgeoisie towards the traditional privileges wealthy nobility landowners possessed; resentment of the Catholic Church’s influence over public policy and institutions; aspirations for freedom of religion; resentment of aristocratic bishops by the poorer rural clergy; aspirations for social, political and economic equality, and especially as the Revolution progressed the idea that the people should hold power, rather than autocratic rulers – aka republicanism; hatred of Queen Marie-Antoinette, who was falsely accused of being a spendthrift and an Austrian spy; and anger towards the King for dismissing governmental officials, including finance minister Jacques Necker, who were popularly seen as representatives of the people. And in a symbolic gesture in 1790, Gilbert du Motier, more commonly known as Marquis de Lafayette, a French aristocratic military officer who commanded US troops in several battles, including the Siege of Yorktown, and who fought in the French Revolution, gave the heavy, 1-pound cast-iron Bastille key to President George Washington who displayed it prominently at government facilities and events in New York and in Philadelphia until shortly before his retirement in 1797. Even today, the key remains on display at Washington’s Mount Vernon residence. Once calm was restored, the people’s assembly authorized bakers to make only one kind of bread – “bread of equality” (pain d’ egalite) – made from flour that was ¾ wheat and ¼ rye with the bran included. White flours, long used by the wealthy, were banned, and rationing was introduced. The victory of the republic and the abolition of feudal priviledges later permitted the return of white breads to the table, but the “pain d’egalite” eventually became the everyday bread. After Napoleon came to power, he determined not to make the same mistakes his predecessors made. His government issued decrees that established standards for French bread, specified ingredients and baking methods, elevated the status of professional bakers, established quality control for flour milling, mixing, and dough kneading, and ended the speculation in grains by farmers and commodity brokers. Somewhat later, local governments added to those decrees, and specified ways to knead and aerate the dough and established shape and size criteria for any loaf designated an authentic French baguette. By the 19th Century, technological advancements helped the wheat harvest, bread was much more accessible – especially for farmers who increased their consumption – cooking in communal ovens declined, and bakers were recognized as a separate entity from oven owner/operators. By the 1920’s bread-making techniques developed in which slow fermentation is 100% guaranteed by yeast, kneading duration is shorter, the shape is elongated, the dough irregularly aerated, and the French baguette was known worldwide. 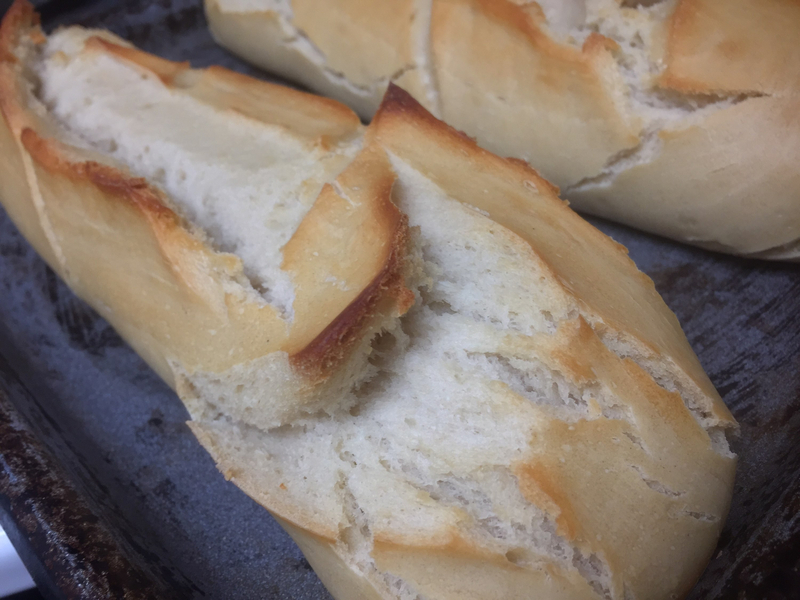 An Authentic French Bread Recipe! Begin to knead the dough. Kneading activates the gluten protein in the bread, and more fully integrates the yeast throughout the dough. 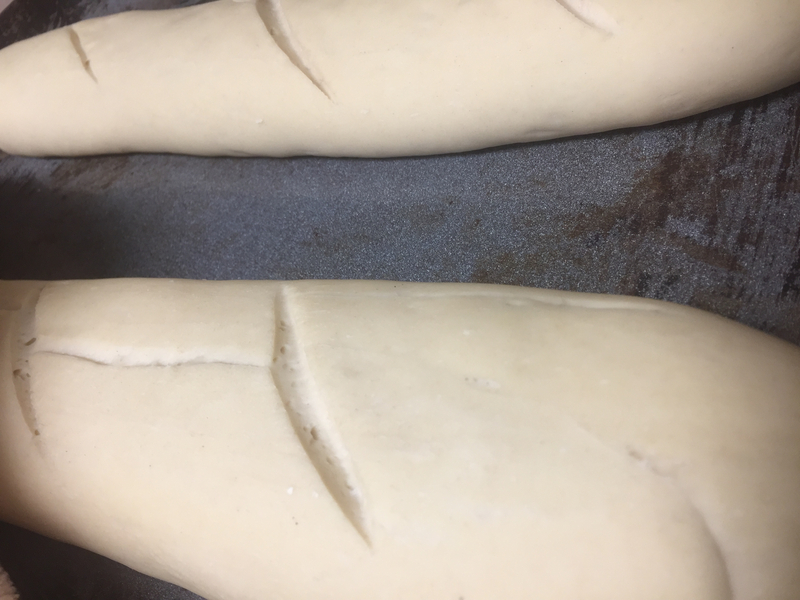 When the dough is fully kneaded, it should stretch easily without falling apart when pulled. Set the dough aside in a bowl to ferment for at least an hour, covered with a towel, plastic wrap, pan, or something similar, during which time it will rise, and double in size. After it has doubled in size, prepare the loaf by folding the dough over on itself several times, then halving the dough ball to make two loaves. Bake at 350ºF for about 30 minutes. When done, the loaves should have a somewhat “hollow” sound when tapped. This entry was posted on Wednesday, November 14, 2018 at 12:07 PM	and is filed under - Even MORE Uncategorized!, - Transfer: How do we get THERE from HERE? (Add a 'T'.). Tagged: American Revolution, baking, bread, cooking, FAKE NEWS, food, French Bread, French Revolution, history, how to, loaves, recipe. You can follow any responses to this entry through the RSS 2.0 feed. You can leave a response, or trackback from your own site.